The 34-year-old patient visited the Department of Prosthodontics with Propaedeutics of the University Hospital Tübingen (Head: Prof. Dr. H. Weber) due to the loss of the all-ceramic crown 11. Teeth 11 and 21 were treated with two all-ceramic crowns about 15 years ago. According to the patient, crown 11 had become loose and was then lost (fig. 1 above). The patient wanted a timely restoration of the crown with the best possible integration into the existing restoration of the adjacent tooth. 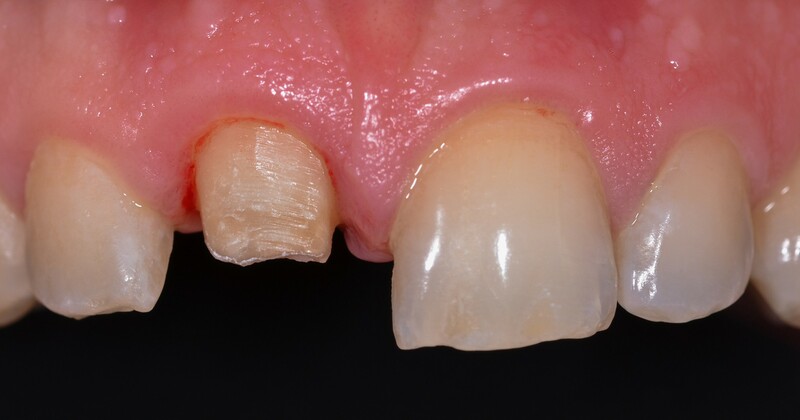 As an immediate measure, a temporary Protemp restoration was fabricated using a preformed mold (Frasaco) and the patient was scheduled for preparation and digital impression-taking. At this appointment, a pronounced chamfer was reprepared, whereby the preparation height of the previous restoration was retained, as this was already lower than would be required for a new preparation today (fig. 2). For gingival displacement and hemostasis, a retraction thread (size 0, Comprecord) was placed before impression-taking, where it was left during the digital impression-taking with the 3Shape Trios 3 scanner. To compare the later results with a conventional precision impression, an Impregum Permadyne impression was taken using the double-mixing method. The scan data (STL data set) and an alginate impression of the opposing jaw were forwarded to the laboratory. 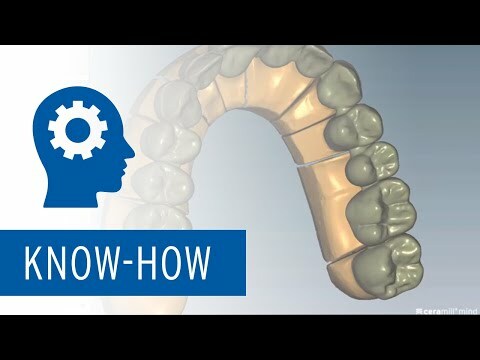 The scan could be imported and further processed in the Ceramill Mind (CAD software). First, the crown was designed fully anatomically and then reduced labially by 0.8 mm to allow ceramic veneering of this area later (fig. 3). The anterior crown milled out of Ceramill Zolid FX Multilayer A2/A3 was densely sintered in the Ceramill Therm S high-speed sintering furnace in only 2 hours. During this time, a digital saw-cut model was generated from the scan data and also milled on the 5-axis Ceramill Motion 2 5X milling machine (fig. 4). The milled model of the upper jaw and the plaster model of the lower jaw were articulated with reference to the skull. The densely sintered crown could be placed and checked on the thus fabricated saw model. A try-in was not necessary (fig. 5). The fit was also checked on the analogously fabricated control model of the physical impression, and was perceived as being identical. Thus, one could proceed immediately with the veneering of the labial portion of the crown. Immediately before glaze firing, the crown was adjusted intraorally to the fine color characteristics of the adjacent tooth in the laboratory. As the patient was highly satisfied with the esthetics of the new crown, it could then be incorporated definitively. Insertion was performed via bonding (dual-curing, transparent luting material Multilink Automix / Ivoclar Vivadent) according to the manufacturer's specifications (fig. 6).